Last November, in spite of one of the most heated, contentious campaigns in American history, conservatives and liberals, Republicans and Democrats alike still managed to unite in approving billions of dollars for local parks and natural areas, according to the Trust for Public Land (TPL). Millions of Americans across the country gave the thumbs up to ballot measures calling for increased taxes or municipal bonds that provided more than $6 billion on behalf of land conservation, parks and restoration. Eight of the ballot measures this past November election day were in California, and all of them passed, mostly by lopsided margins, a strong testament to the commitment of Californians to protecting their beloved and beleaguered parks and open spaces. The funding approved in Los Angeles and San Diego counties, nearly $1.9 billion and $2 billion, respectively, were the two largest amounts of parks and open space funding at stake in the entire country. Robert Louis Stevenson State Park in Napa County, one of the counties that passed a ballot measure protecting open space in 2016. 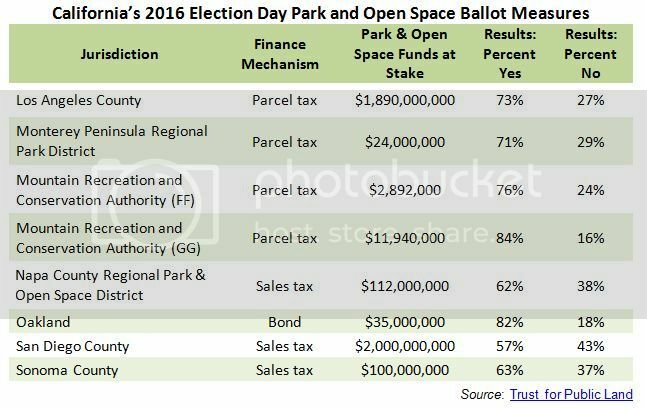 TPL reports that in referenda held earlier in 2016, 14 of 17 parks and land conservation ballot measures had also passed, earmarking an additional $3.3 billion for parks and open space. Combined with November’s total, the 103 measures on the ballot in 2016 were the largest number since 2008. This marked a return to levels of park and open space ballot activity at the local level not seen since the Great Recession. The TPL was founded in 1972 by Huey Johnson, Resources Secretary from 1978 to 1982 in the first Gov. Jerry Brown administration. A 2001 recipient of the United Nations Environment Programme’s Saskawa Prize, one of the world’s most prestigious environmental awards honoring environmental activism, the indefatigable conservation leader Johnson also founded the Grand Canyon Trust, Environment Liaison Center and the Resource Renewal Institute. Protecting open space and nature not only confers ecological benefits, but very real, demonstrable psychological and physiological benefits to Americans. Studies document that protected open space rejuvenates the American body, spirit and soul. Parks and open space are preventative measures that can actually lower health care costs and reduce the need for medical interventions. Exploring or even just gazing upon natural areas – such as a grassy hillside dotted with California live oaks – gives us a sense of perspective, continuity in a changing world, connectivity with nature, spiritual renewal, and a feeling of harmony. The presence of open space within and adjacent to our urban areas – and the assurance that this open space will outlast us – serves to counter-balance the stresses and strains of modern life. Strolling along a California trail on a bright, crisp morning through coastal sage scrub scented with other flowers can be an intoxicating experience. Research on the physiological benefits of open space has centered on how direct or indirect (vicarious) experience with vegetated and/or natural landscapes reduces stress and anxiety. Back in the 1970s and ‘80s, a series of studies linked photo simulations of natural settings to reduced stress levels as measured by heart rate and brain waves. One study revealed that subjects experienced more “wakeful relaxation” in response to slides showing vegetation only and vegetation with water compared to urban scenes without vegetation. These data were corroborated by attitude measures which indicated lower levels of fear and sadness when experimental subjects observed nature-oriented slides, as opposed to urban slides. In studies of hospital patients who enjoyed views of exterior greenery compared to views of buildings among the control group, recovery was faster, there were fewer negative evaluations in patient reports, and there was less use of analgesic drugs among post-surgery patients.